Unfortunately for him, I’m in lazy-mode right now when it comes to bentos, but I’m going to start consulting the menu each night and asking the two of them ahead of time if they want lunch from home or school lunch. I think it’ll be good if he’s had enough of the school lunch to know which things he likes and which he doesn’t. 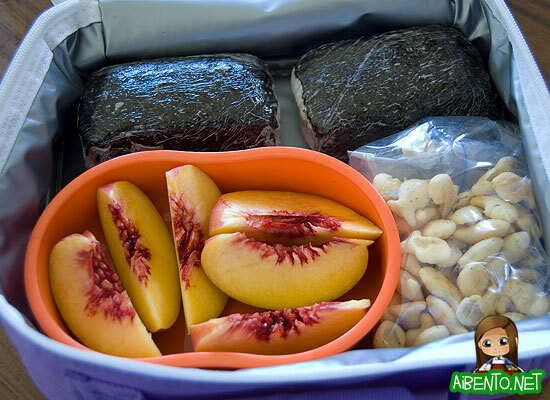 Baby Girl had a field trip, so I made her spam musubis at her request and packed them in a bag that Grandma J gave her. Notice I call these “home lunches” because they’re really just a bunch of different foods packed into a bag. Not exactly a bento. I gave her two musubis, some sliced peaches (which she loves), and a small bag of Sour Cream & Onion goldfish. 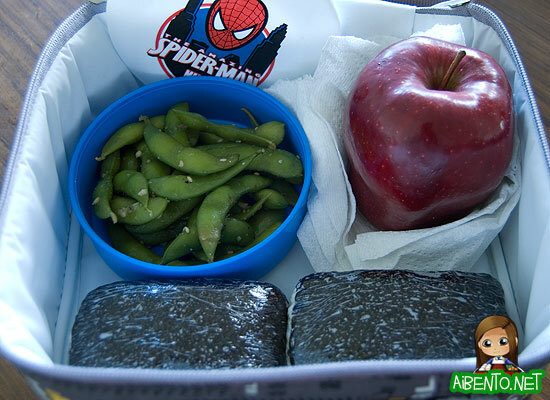 His lunch had two musubis, some garlic edamame from Foodland, and a whole red apple. Unfortunately, even though I put a band around the Spider-Man box, he was flinging his lunch all over the place and all the beans spilled out. He wouldn’t eat the apple because it had garlic sauce all over it (I wouldn’t have either) and then he forgot his lunch bag at school, so it was all gross when I picked it up this morning. Thankfully, I can wash the apple and give it to him another day. At least he ate the musubis though! I realize I haven’t been posting much, but I’ll explain why that happened, hopefully soon. It’s something very exciting!